(CNN) -- Shane Lowry won his home Irish Open in a dramatic play-off at County Louth on Sunday to become only the third amateur ever to take a European Tour title. 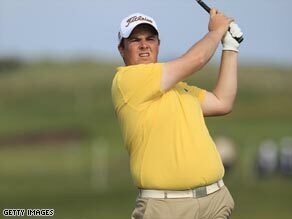 Amateur Lowry stunned the professionals by winning his first-ever European Tour event at County Louth. Playing the very first Tour event of his life, the 22-year-old won on the third extra hole after missing a birdie putt of less than four feet on the final green. Lowry tied with England's Robert Rock on 17-under -par as a result and at the first hole of sudden death, played in pouring rain, Rock had a nine-foot chance to win, which he missed. After the pair both birdied the next hole, Rock ran up a bogey six and Lowry holed from 12 inches to secure a famous win. Sweden's Johan Edfors finished third on 273, two strokes behind, with England's Nick Dougherty and Scot Marc Warren sharing fourth position another two shots back. Two years ago, at the Estoril Open, Spaniard Pablo Martin became the first amateur to win a European title and only three months ago New Zealander Danny Lee became the second at the Johnnie Walker Classic in Australia. For Rock it meant more heartbreak as he finished runner-up for the third time this season. The 32-year-old also came second at both the Alfred Dunhill Championship and last week's BMW Italian Open.